San Diego Cruise Port is a fabulous place to start your cruise. The port of San Diego has expanded in recent years and now offers a great choice of cruises from a number of different cruise lines. 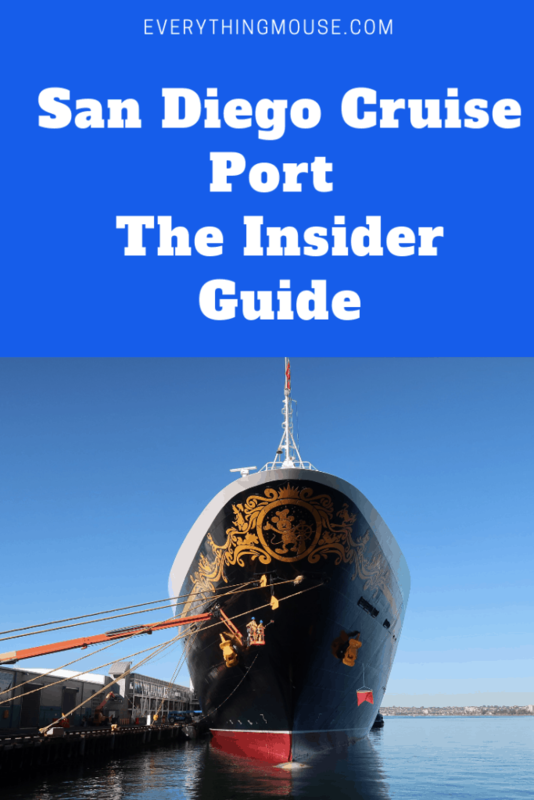 Here we explore your different options for San Diego cruise port hotels and parking. San Diego Cruise port is growing rapidly. There is a great choice of cruises out of San Diego from a growing list of cruise lines. These include Disney cruise lines, Holland American, Celebrity and Royal Caribbean. We have sailed many times from the San Diego Cruise Terminal. 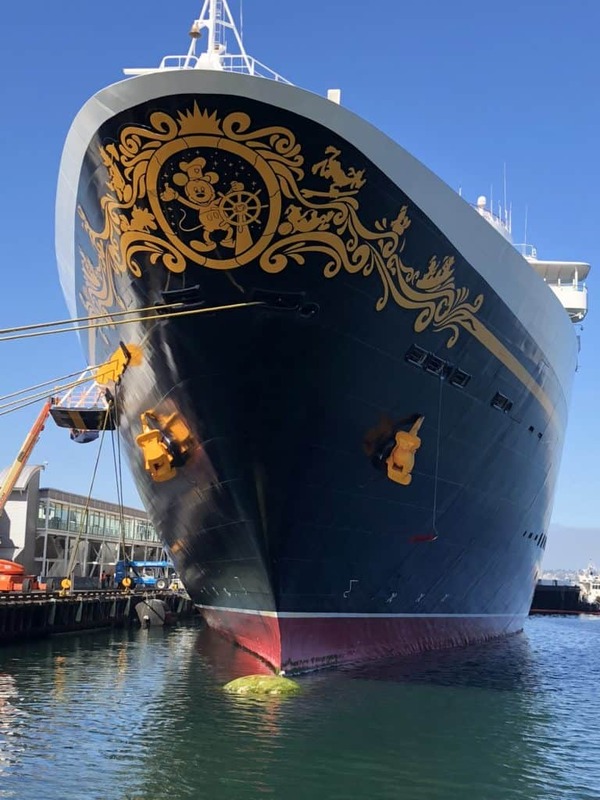 You can read about our Disney Cruise From San Diego. San Diego Cruise Port terminal is located close to the heart of the downtown area. 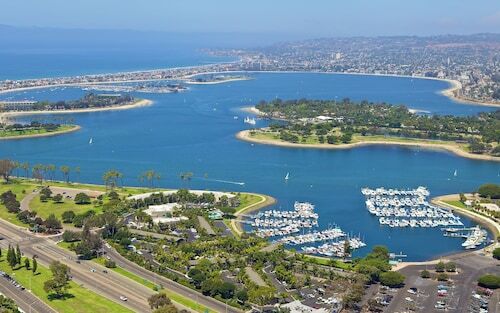 The cruise port is located on the beautiful San Diego Bay. The San Diego Cruise port address is B Street Pier 1140 N Harbor Drive, San Diego, CA 92101. The port is only about 3 miles away from the San Diego Airport. It’s too far to walk to the Port from here if you have luggage. However, the car ride will only take about 10 minutes from San Diego Airport to the Cruise Port. There are a number of options for shuttles from the cruise port. However, we think that if you are arriving at the airport and just want to get to the port, a ride sharing service is a much better idea. An Uber will only cost around $10 to $12. Lyft will be slightly less at around $8. The most expensive option from the Airport to the Port will be a taxi which will cost in the region of $20. There is public transport from the airport to the cruise port. This is just $2.25 per person each way. The bus you need is the 992 which runs from the airport to downtown via the cruise port. Arriving by train is another option. The Amtrak Train Station is just a few blocks from the cruise port. You can easily walk unless you have a lot of luggage. As you would expect, there are many fabulous hotels in San Diego. 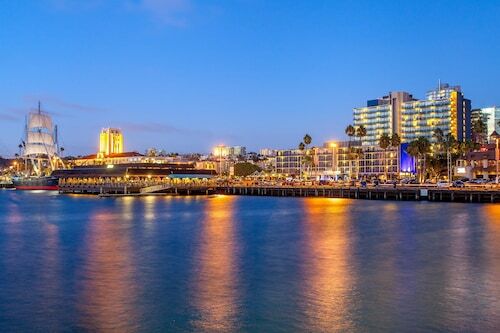 As the cruise port is right in the heart of San Diego downtown you have a lot of hotel options which are very close to the start of your cruise. However, there are only a handful of hotels which have cruise and park packages. If you are arriving by plane or train there are many great options which are suitable for a range of budgets. Bringing your own car and needing cruise parking complicates this a bit. You can either choose one of the few hotels which does offer a San Diego cruise port park and stay package. Or you can stay in a different hotel and use an independent car parking option. This will most likely be more expensive than a San Diego cruise and stay package. However, it will give you more options. We know San Diego very well. Here we have split up the choices of hotels with cruise parking packages and those without. Then we will also explore parking only options so you can work out what the best solution is for you and your family. There is a limited selection of hotels in San Diego which offers a cruise and stay parking package. Here are the best options for you. If you want a hotel close to the cruise port you really can’t get any closer than the Wyndham San Diego Bayside. It is right across the street from the B Street Pier. Not only does the close proximity to the port mean you have just a short walk in the morning to your cruise. It also means you will be able to wake up and look out the window and see your cruise ship right there! This is an older hotel, but it has been recently renovated. Rooms are a decent size and have either a King or two Doubles. The hotel does not have it’s own restaurant. However. there are plenty of restaurants within walking distance. A Park N Go Package starts at $284 a night. This includes parking for 7 days whilst you cruise. Note that if you do not opt for a cruise parking package, the standard rate is $32 per night. This is pretty standard for the location, However, you really don’t want to find that out when you arrive. If you are going to park at the Wyndham and then go on a cruise, definitely get the cruise parking package. The Comfort Inn San Diego At The Harbor is another great option if you are taking a cruise out of San Diego. It is further out from the port than the Wyndham, but offers lower pricing. The Comfort Inn is around 4 miles from the port. The hotel offers a free shuttle to the cruise port. It is a motel style hotel with outside corridors. The rooms offer either one King bed or one Double. There is a decent breakfast which is included in with your room rate. If you are looking for a clean motel for a one night stay before your cruise this is a good option. The rates usually can’t be beaten, particularly if you are bringing a car and want to park whilst on the cruise. Rates start at $129 per night and include parking for 7 days. The Dana is just a bit further out from the cruise port at 6.5 miles away. They do not offer a shuttle service to the cruise port or the airport. Therefore if you arrive without a car you will need to take a ride sharing service or a taxi to the cruise port. The location of the hotel is on the stunning Mission Bay. Many of the hotel rooms have views of the water. The hotel offers either one King or two Queen beds in a room. Nightly rates start at around $125 and a cruise and park package is also available. However, be aware that room rates do not include $32 resort tax plus $20 for parking per day. The Hilton San Diego Airport is a great option if you want a high quality hotel with a cruise and park option. This highly rated hotel is close to the airport so is a particularly good choice if you are flying in the day before your cruise. The Hilton San Diego Airport offers a free shuttle to the cruise port. It is only 3 miles from the San Diego cruise port so it’s a convenient location. The hotel offers great views of the City and San Diego Bay. You can choose from a King room or one with two Queens. Rooms even have a balcony so you can enjoy the fabulous views. Prices are from $175 per night. Here is a selection of some of the best hotels in San Diego. They do not specifically advertise a cruise and park package. If you book these hotels and are bringing a car you out likely will want to check out the parking only options as well. Some of the hotels in San Diego can charge as much as $50 per night for parking. So always make sure you are book parking separately if you want the best deal but an hotel which doesn’t offer cruise and stay parking. Embassy Suites is always one of our favorite picks. They are consistently of a high standard and are a great option for families as you can accommodate more than 4 people in a room comfortably. The breakfasts are always good and are included in with the room rate. All rooms are described as suites. What this means is that you will have two rooms. One with either a King or two Doubles. The other room has a sofa bed and a kitchenette. You can’t cook a gourmet meal but you can prepare something for your family to save a bunch on a restaurant meal if you want to. Embassy Suites also offers a great complimentary breakfast. We have stayed at many Embassy Suites and have always found this to be of really good quality with a decent selection of both cooked and cold breakfast food option. Embassy Suites San Diego also offers an Evening Reception with hot and cold food items and beverages including beer and wine. If you have a family these included food options can save you a lot of money. 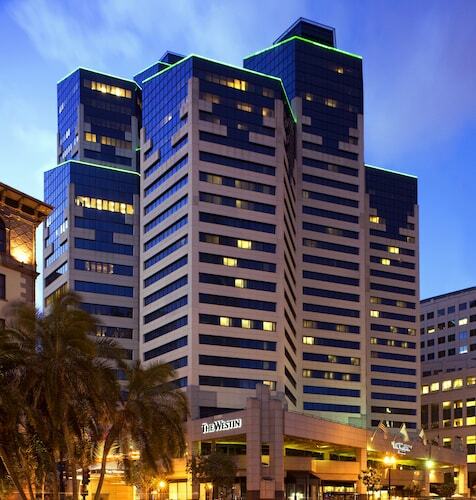 The Westin has an amazing downtown location which is also just a short ride to the cruise port. If you are looking for all the high standard features which a Westin offers, you will be sure to enjoy staying at this imposing San Diego Bay hotel. You are within easy walking distance of Little Italy and the Gaslamp Quarter. The views of the San Diego Bay from the Westin are stunning. Of course a bit of luxury comes at a price. Room rates start at around $180 per night. The Westin San Diego also has a resort fee of $28 per night. Parking is valet only and is a whopping $50 per night. Yes you read that right! The Westin does not have a cruise and park package option. It doesn’t have any special packages for San Diego cruise passengers. However, it is a fabulous hotel which is very convenient for seeing all the sights of San Diego. 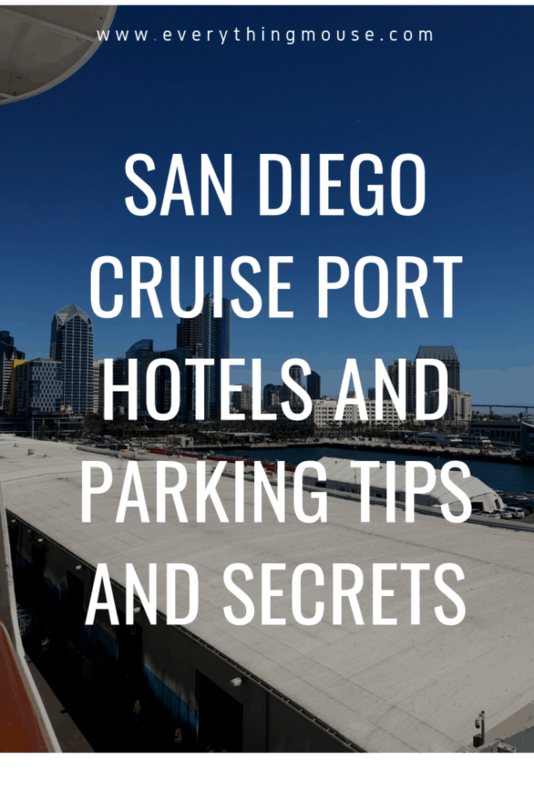 If you do not need an hotel for your cruise but you are bringing your car, there are a number of San Diego Cruise Parking options. San Diego Cruise Port is rather unusual because it does not have a dedicated parking lot. Therefore you have to do a bit of research to find out what the best parking options are when you sail on a cruise out of San Diego. Many of the parking options are advertised as airport parking. The Cruise Port and the Airport are not too far away from each other. Some options have a shuttle to the cruise port, but not all do. So be careful to factor this in if you are booking one which is not walking distance, as most aren’t. rates start at $13.95 per day for an uncovered parking lot. Covered and valet parking are also available. is close to both the airport and cruise port. This is a more pricey option at $16 per day. However, this is for covered car parking.
. This is very reasonably priced and located right opposite the San Diego Cruise Port. However, this gets booked up really quickly, so make sure you check this one out far in advance. There is another new San Diego Cruise Port Parking option which is right across the street from the port. It is on the high side at $16 per day, but it is very convenient for the port. Click Here for more details. Here is a complete list of cruises out of San Diego for the first months of 2019. As you will see, the San Diego cruise port is mostly used by Holland American and Disney cruise lines. Celebrity and Royal Caribbean Cruise lines also have some ships sailing out of San Diego. These are repositioning cruises which sail through the Panama Canal.